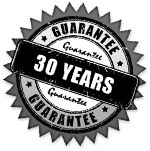 Our work comes with a 30 year unconditional guarantee. All of our services come with a 20 Year Unconditional Manufacturers Warranty. In addition to this we guarantee customer satisfaction with all of our work and subsequent replastering completed by us for 30 years. If the dampcourse fails within this time, we will reinstall it to the apparent failed section free of charge.